Kinetic lanterns for Lotte World's luminescent night time parade, Seoul S. Korea. 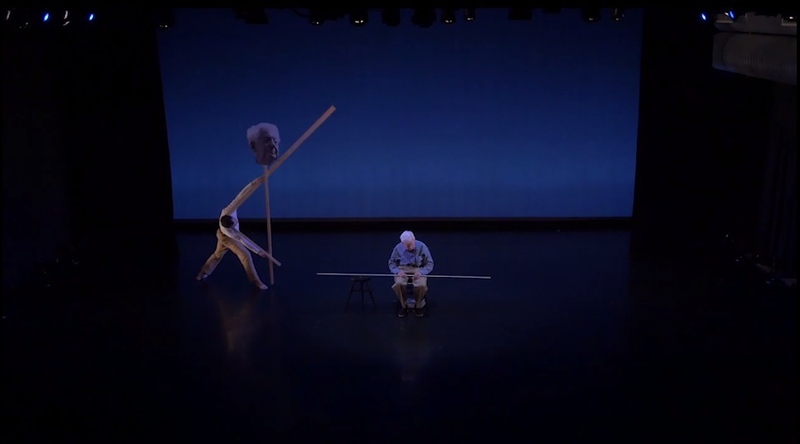 Co. Venture is a collaboration between Papper Fajans (31) and David Vaughan (92) whose friendship was fostered during their time with the Merce Cunningham Dance Company (Vaughan has been Cunningham's archivist for over 50 years and Fajans was Cunningham's personal assistant during the final years of his life). 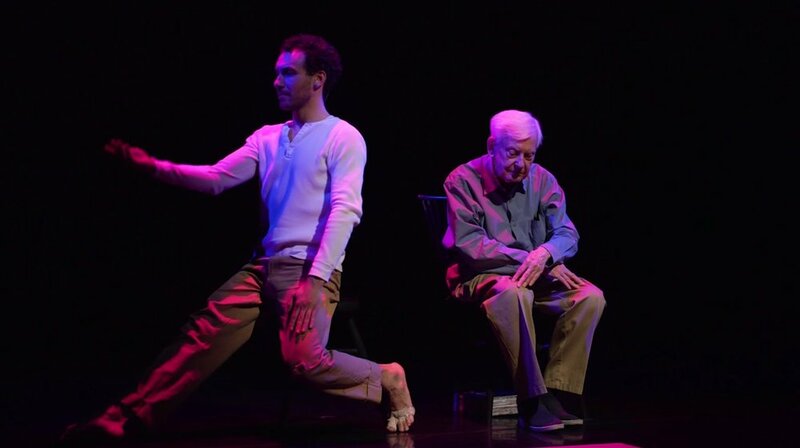 Co-Venture uses dance, material theater, and naturalistic reminiscence to reflect on the endurance of an unlikely friendship, the power of movement, and the legacy of Merce. New York premiere at Baryshnikov Arts Center, 2016. Using a wireframe sculpture, an inflatable ball, and a light source, Barn 18 is a shadow projection of a pole barn which slowly falls behind its horizon line over the course of 18 minutes. This piece was used as the decor for Holley Farmer's arrangement of a Cunningham MinEvent at Sarah Lawrence College in December 2016. The piece included: Changing Steps (1973), Canfield (1969), Biped (1999), Un jour ou deux (1973), and Rune (1959). 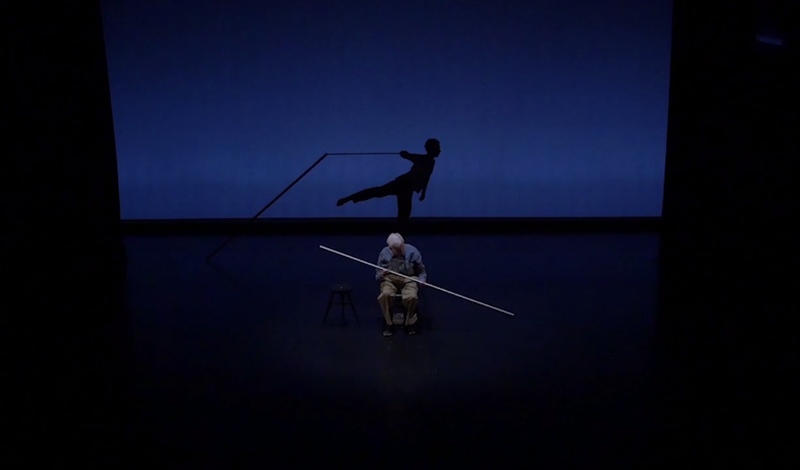 Merce Cunningham (1919 - 2009) is regarded as one of the most important experimental choreographers in American dance. 'MinEvents' were devised as a way to find ways to incorporate Cunningham's work into a variety of venues, in particular for university dance departments. The eleven acre site of cactus and mesquite just south of Lake Worth is remarkably layered. During the Cretaceous, it was part of Texas’ ancient shallow sea. Until the late 19th century, it was a Comanche settlement. Up until ten years ago, it was home to the Ft. Worth gun club (before they shot through a neighbor’s kitchen window and were evicted). The ground is still largely covered with fossilized remnants of plants and bi-valves alongside arrowheads and bullets. Currently, this complex and heavily anthropogenic landscape is home to the Hip Pocket Theater who have staged original work outdoors under the direction of Johnny Simons for over 30 years. The majority of the visible landscape is altered by a labyrinth of 10’ high man-made berms and derelict architecture left over from the gun-club. The water table has been poisoned from the years of lead seepage. The landscape itself is largely treated as county property, though maps clearly show the area to be public parkland, a grandfathered status that can never be revoked according to Texas law. With a team of artists from New York in a multi-week residency and with the help of the Hip Pocket community, our interest is in performing large-scale, community-based, and site-specific work with themes drawn from the landscape itself. Each September since 2005, puppetry performances, processions, and films involving the community of Ft. Worth on themes ranging from mineral rights to the poetry of Pablo Neruda have been staged amongst the berms and junk piles to reclaim the land into a viable, anarchic site for uninhibited and borderline illegal artistic exploration. The Strandzha Project is an ongoing collaboration between U.S. and Bulgarian theater artists interested in interpreting archaeological material through performances of object theater. The project started in 2003 when archaeologists Kathleen Hawthorne, Robert Somers, and I started a dialogue about how current trends in post-processual archaeology were opening the door for new ways to relate the material record to the public. Whereas both fields are rooted in physical matter, the idea of using object theater to present archaeological research is unorthodox but potentially more attuned to the human story behind historic discards, lifting them from the glass cases and setting their otherwise staid circumstantial didactics to music and lay interpretation. The project gets its name from the Strandzha region, a hinterland between Bulgaria and Turkey that is largely unexplored with no extant maps, no tourism, and a bewildering number of significant archaeological sites and unique cultures including the Nestinarii, famous for their millenia-old rituals of entranced walks on hot coals. In 2001, I was invited by Kathleen Hawthorne (a remarkable creature who I first met in India in 1989) to an abandoned brown field adjacent a ceramics factory in Transylvania to help out with a archaeological excavation of what was presumed to be a Dionysian sanctuary. Among the pottery shards, millennia- old chicken bones, and other Roman relics were small figurines with articulated phalluses. These tiny puppets were presumably used in private sanctuaries to the god Sebasius (akin to Dionysus) as the god of dying and resurrection of nature to the Thracians (6,000 BCE - 1st century BCE). These are some of the oldest forms of puppetry in the world, akin to the Osiris fertility figurines of Egypt. In 2003, I returned to Bulgaria with a grant from TCG/ITI to travel and locate potential partners for a U.S./Bulgarian collaboration in puppet theater on archaeological themes. This year brought me to the National Academy of Theater and Film Arts in Sofia where I met professors Slavcho Malenov, Petr Pashov, and wife Zheny Pashova. During this visit, I just happened to catch a new performance of the Pashov’s senior class entitled Bezani or “Sleepless” - 9 vignettes about love and loss using simple materials and live music. With a cast of 20 or so extremely talented performers, live traditional Bulgarian music and songs, and elegant, simple puppetry with minimal means (including silk parachutes, water, and spinning wheels) I was duly impressed. 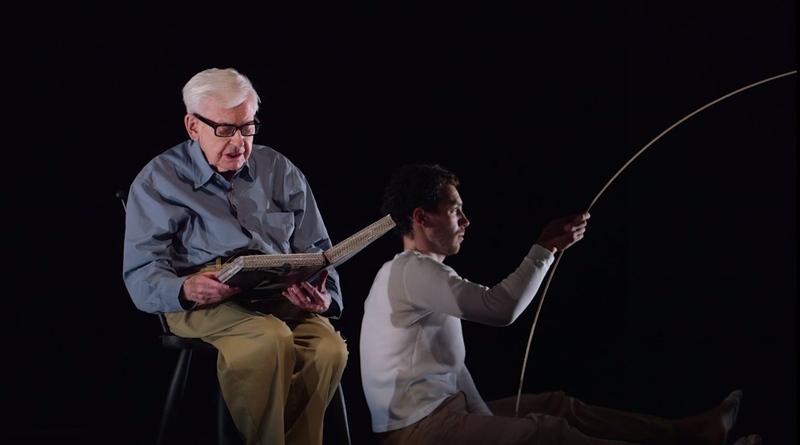 Ironically, the group I came to work with was as young collective called Theater Nobodies - a cadre experimental puppeteers eager to break the academic molds given to them by the Academy. This collective, led by Magdalena Miteva, Mila Kolarova, and Pepe Gaidarov, would become the missing piece to the project. We chose the site of Develtus near the Black Sea as a potential site to glean material and possibly perform. This enormous site contains layers of settlement stretching back to the Thracians as seen in the numerous tumuli or burial grounds of the necropolis, still unexcavated today and left overgrown in farmer’s fields. These tumuli have been used over the centuries as public graves and so excavating these reveals layers of internment, including bodies nailed to the ground - a common way of burying suspected vampires. Judging by the fact that a necropolis historically demarcated the ends of a city, this site is at least a square kilometer in size. This is a life-long project with long periods of hiatus between iterations. Next project will be about the centuries old public thermal spigots in downtown Sofia and how they are used every day and widely considered to have healing properties. Portable Diary of the Forgotten was a collaboration with Rajeev Sethi / Asian Heritage Foundation, SARTHI, and community members of Kathputli Colony (Colony of Wooden Dolls), an infamous 'informal settlement' in West Delhi, India. The challenge posed by Sethi and his team: How can we re-conceive the centuries old bioscope so that it becomes a technology to tell a contemporary story meaningful to those who rely on it for their sole livelihood? Community members were asked to contribute visual representations of dreams, memories, and aspirations in any form that could be included inside the bioscope by way of photographs and printed material. Those outside the community who turned the cranks of the bioscope would see these images drift by with the accompanying sound of voices, songs, and stories. "The Austin event ( March 28, 1997), was the largest ever mounted outside of SF to date. The venue itself was a 1/4 mile oval racetrack with fixed seating for 4500 persons, located just south of Austin. An assortment of unusual prop and set elements were built and used to fill the 500' long area inside the oval track. Among the items in this spectacular backdrop were, a 30 ft hydraulically actuated boat disaster prop, a 35' high triangular tower with an entire cow spiked on a rotating spit, a Black Cat fireworks stand filled with assorted explosives, the ultra tacky Clown Box, the Bubba Crane, (a junkyard drop crane, rigged to drop a 60's era- dune buggy from a height of 25' over and over again), and for a distinctly local flavor, a 1/2 scale replica of the University Tower, site of the Charles Whitman massacre, was constructed and used as the set centerpiece. Several new devices were debuted for this event including the Large Shock Wave Cannon, (a 4x scaled version of smaller, window shattering designs), the Boeing Jet / Flame Whistle, and the Hand-O-God, (which was mounted on the Bomb Loader). New contributions from the People Hater crew included the Coffin Bot and the Tractorbot. As show time arrived, a record breaking 4700 people passed through the gates. Festivities began with a blistering run around the track by Deszo in the Jet Cart. The mayhem commenced with the Big Arm dashing a puppet motorcyclist to the ground while the Bubba Winch proceeded to obliterate the Dune Buggy. Crew members commenced to fire parachute flares in the air, 60 in all (some of these ignited fires in the surrounding wooded areas when they failed to extinguish themselves before landing). Machines jockeyed for position as the Large Shock Wave Cannon proceeded to brutalize the audience, literally knocking them around in the stands for the entire show. The V-1 emerged and wound its way to the Spiked Cow, where it proceeded to roast the carcass. Christians Subjugator perpetrated spectacular mayhem on the Boat Disaster Prop as the Clown Box suffered the indignation's of the Meter maid Cart and its Flameballs. As the action raged, and machines slipped slowly into disrepair, the Flame Whistle and the V-1 set enormous fires that engulfed numerous most of the set elements including the University Tower Prop and the Carnival Tent. With the unforgettable collapse of the 55' Tower, machine activity eventually ground to a halt…"
For Carmen de Lavallade's performance of The Creation at Lincoln Center Out of Doors in 2015, we were asked by Lincoln Center Education to develop the visual elements for her solo and then work with children and seniors at the Lincoln Square Neighborhood Center to bring them to life. The materials for this workshop were pulled directly from Geoffrey Holder's vast personal stock that he had kept for projects in sculpture, fashion, or set design with the direction of Leo Holder, Geoffrey's son. We designed and built the puppets, trained the multi-generational volunteers from the Center on how to operate them, and then worked directly with Carmen and her team to conceive and stage how the various puppets and objects would be incorporated into her solo. When the community members joined her on stage in front of an audience of 1,000 people, some of them were performing for the first time in their lives. The 1972 solo was choreographed and scored by Geoffrey Holder, and was here accompanied with vocals by the Ebony Ecumenical Ensemble. Dancer and actress Carmen de Lavallade made her professional debut as a principal dancer with The Metropolitan Opera. Her career has spanned stage and film and she has collaborated with celebrated choreographers including Agnes de Mille, Glen Tetley and John Butler. Texas Fragmented was a temporary, site-specific work of light and video projection suspended an otherwise inaccessible corner of City Park, in Ft. Worth, TX. The disjointedness, visual trickery, and forced perspective of the work references the disorienting complexity of Texas property law and the ongoing fragmentation of rural lands. For this work, a rectangular piece of turf was ‘extracted’ from the ground and suspended using monofilament several yards away from its source. A video loop of a paper ‘actor’ (puppet) trying to gain its balance is projected onto a clear acrylic panel so that the image seems to be floating mysteriously in the middle of the field. Lights are also installed in a suspended fashion to occlude their housing so that they seem to shine without a source. Breezes make the suspended pieces gently rise and fall. 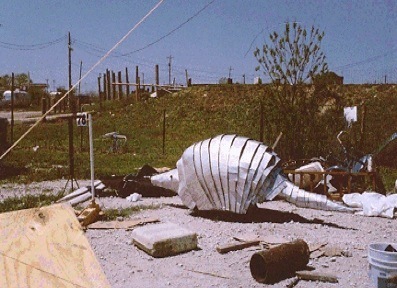 Ricochet Garden was constructed from the remaining debris of a demolished hand-gun range in Texas. With nine lengths of 3/16” aircraft cable added to the existing foundation, a suspension bridge spans the somewhat dangerous detritus (and occasional scorpions) to safely deliver visitors to the other side where motion sensors trigger lights inside a Zen garden raked into a mixture of pea gravel and 30 years worth of spent bullet casings. As visitors walk, their shuffling feet make a metallic music as they stir the thousands of hollow cartridges on the ground. A site originally designed solely for use as a containment chamber for ricocheting bullets is reclaimed as an area for contemplation and silence. Media: Concrete, steel, salvage, aircraft cable, flood lights, motion sensors. Puppets commissioned by the Monterrey Bay Aquarium for their summer deck performance musical "Think Big"
Media: perforated steel, mechanics, sensors, umbrella tines, umbrella fabric. Commissioned by Webb Art Gallery, Waxahatchie, TX, 2009.